I've got a quickie for you tonight. Have you tried coconut oil in your coffee? I've heard of butter in coffee (haven't tried it) and just recently I've heard of coconut oil in coffee. Hmmm. Google it...it's everywhere. So I decided to try it. I have a rather large container of organic extra virgin coconut oil sitting in my pantry that I use for a multitude of things. (Yum...homemade "healthy" mounds bars being one of them!) I like coconut oil. Mine has a slight coconut flavor. Some don't have a flavor, I like mine with a flavor. And one of my favorite flavored coffees is a German Chocolate flavor. Coconut, chocolate, and coffee....there's nothing wrong with that combo in my book. So I decided to try the coconut oil in my coffee. I heat the half and half up. I add the coconut oil and stir with a spoon until it melts. 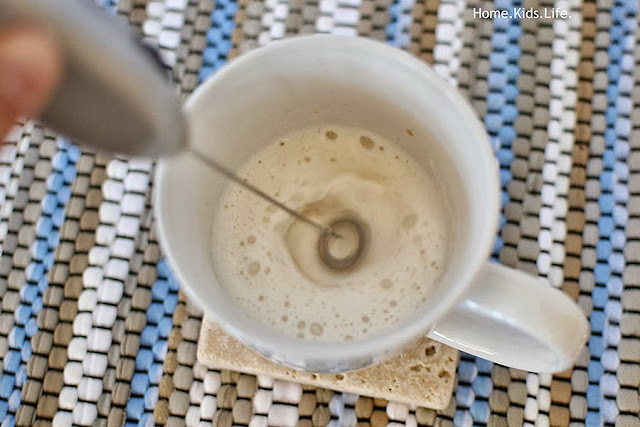 You'll get some oil slicks in your cream/milk or in your coffee if you don't blend/whiz it. 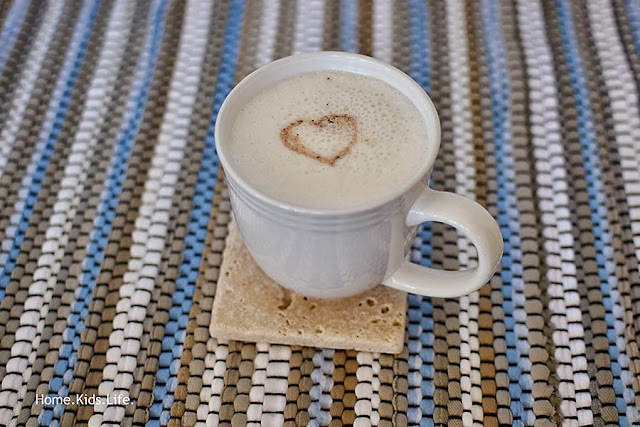 Whiz up with a milk frother. Mine's a cheap one from IKEA. You could also use a blender. Don't use milk/creamer. Just make coffee and blend coconut oil in. 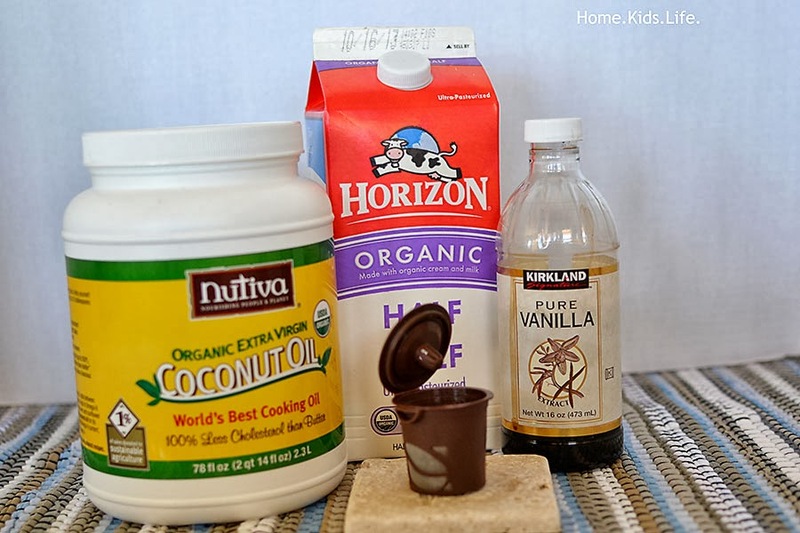 Use hot cocoa as the base and add coconut oil. I do this on Fridays and add a dollop of whip cream. Oh. My. Goodness. That's my treat! 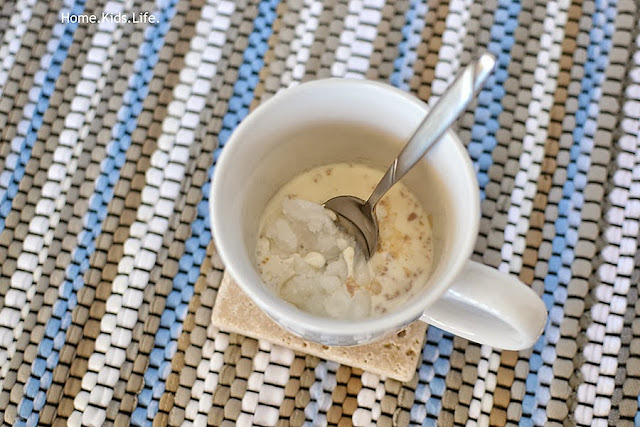 Eating coconut oil in the morning is suppose to give you energy for your day. Add in chia seeds and you'll have lots of energy. (I also add chia to my morning yogurt, I've been doing that for a long time.) I can attest to the fact that I don't get as tired as I use to during the day. But, who knows if it's the coconut oil and chia? Maybe it's just me. Don't double up your coconut oil immediately, unless you're use to coconut oil. I usually only have one cup of coffee in the morning, occasionally I'll have two. When I took these photos I made a second cup of coconut oil coffee and decided to drink it so I didn't waste it. I was a little buzzed and had to even out that wonky feeling with some protein. Whoa. Guess that's why it's not recommended to indulge in coconut oil late in the day. Or a cup of coffee. Coconut oil has helped me cut out sweeteners in my coffee. 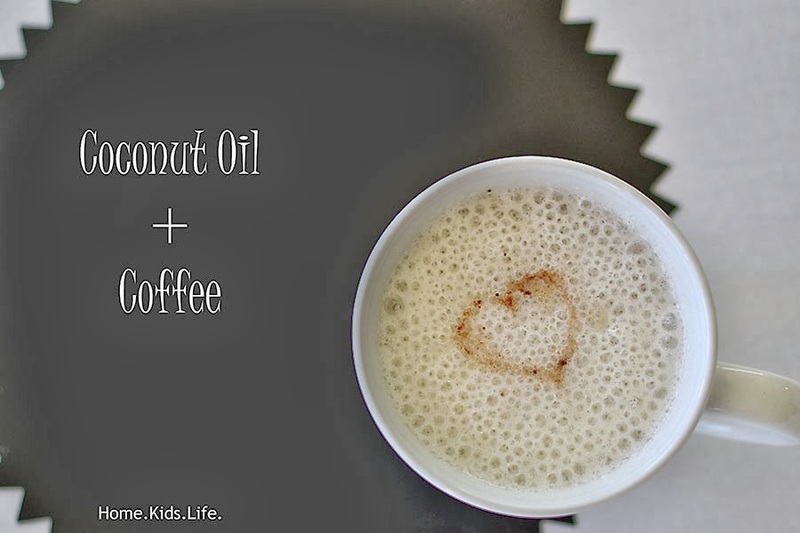 I happen to like some maple syrup in my coffee, but I haven't used it with the coconut oil. Yes, I'm strange. 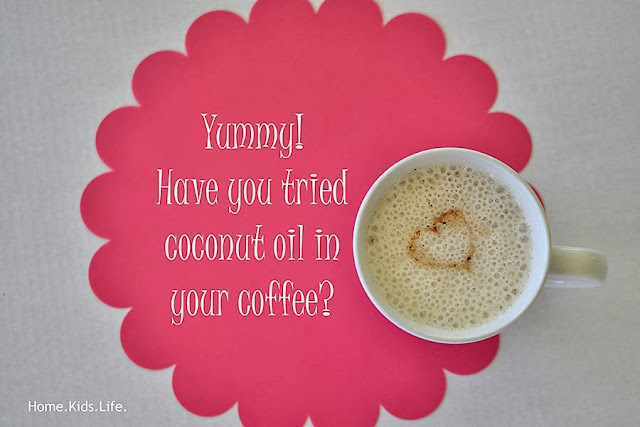 And that is my totally random post on coconut oil in coffee. What do you put in your coffee? Or do you drink it black? Maybe someday I'll like drinking it black. Until then...I'll be adding coconut oil in my coffee at home.